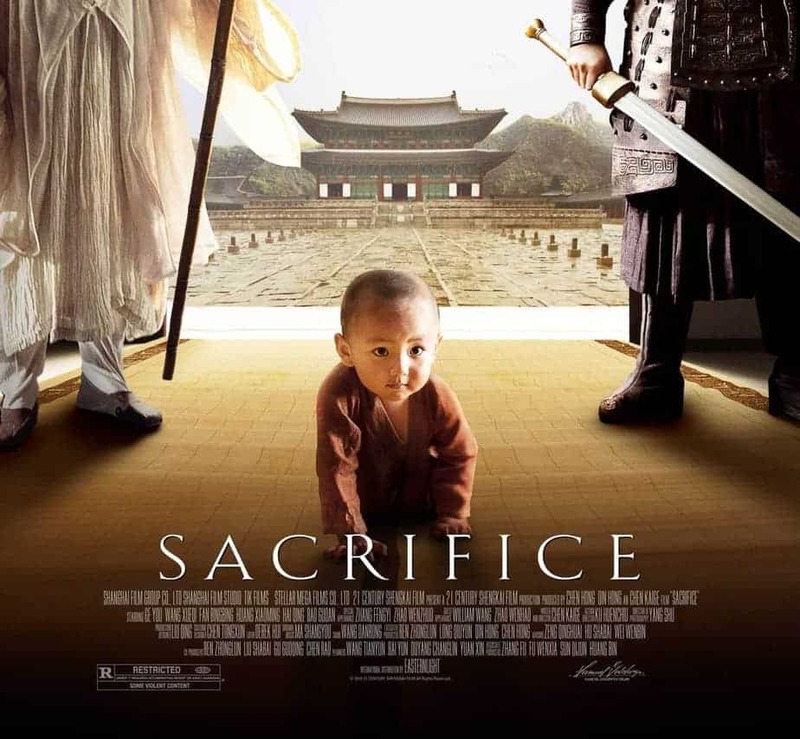 ‘Sacrifice’ is a film adaptation of the ancient Chinese play ‘The Orphan of Zhao’, which in turn was the first Chinese play published in the western world in 1735. The original play takes a Pre-Christ historical fact about a plot to kill the entire Zhao clan and turns it into a tale of vengeance and, conveniently, sacrifice. But the film cleverly tones down the ominous sense of duty that motivates many of the characters of the play in order to make them more believable to a contemporary audience that (maybe sadly) understands revenge better than sacrifice. In this sense, vengeance is almost all that is left to drive the protagonists… at least until the end. Revenge story power-up: include a pregnant lady. Structure-wise, however, the film follows the play’s layout to the letter, deploying a five-act narrative plus a prologue, the latter being the longest segment by far, oddly enough. Asian movie fans are more used to these structures, so different to the three-act western standard, but even the casual watcher won’t be lost or bored by the story, as director Kaige Chen knows how to handle the relevant bits of information to keep us engaged. The first steps of the last of the Zhaos. The six-act framework isn’t the only storytelling oddity in ‘Sacrifice’; the narration stretches through a long period of time and has a clear ‘saga-esque‘ flavor to it, but instead of showing everything from a single perspective, different parts of the story have different protagonists. This happens not only on an act to act basis, but sometimes even from scene to scene… and not always to the best effect. On a couple of occasions, in fact, some secondary characters with almost no development (or even screen time) have their own epic honorable sacrifice scenes portrayed with the attention that a main hero’s death would deserve (you know, elongated slow-mo’s and all), when the reality is that we can’t care much about someone we barely have seen before. But, in the bigger scheme of the movie structure, changing the focus to the character that enables the story to flow makes for a very interesting experience, not far removed from what a choral TV series can deliver, but within the compact confines of a feature film. Sword-fighting 101: know which the business end of a sword is. The remaining aspects of ‘Sacrifice’ are flawless. Camera placement, editing, score, sound… all are transparent in the best kind of way: you can’t see the ‘tricks’ and therefore you are left with the ‘magic’. Maybe a couple of too embellished martial arts scenes here, a too obvious wire usage there… but nothing too gaudy. Mr. Chen’s tasteful approach guides us through an not-too-straight-forward tale that, departing from the pure Confucian allegory of sacrifice for honor (enabling society to be stable, allegedly), draws for us a picture made up of more complex and individual motivations where even chance (an amoral and inevitable force) has its place.